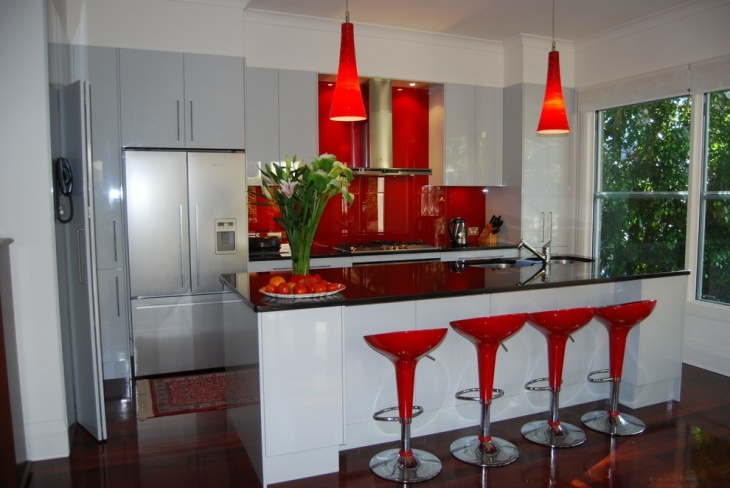 If you are thinking of creating white and red effects for your kitchen interior design, there are different ways to go ahead with it. 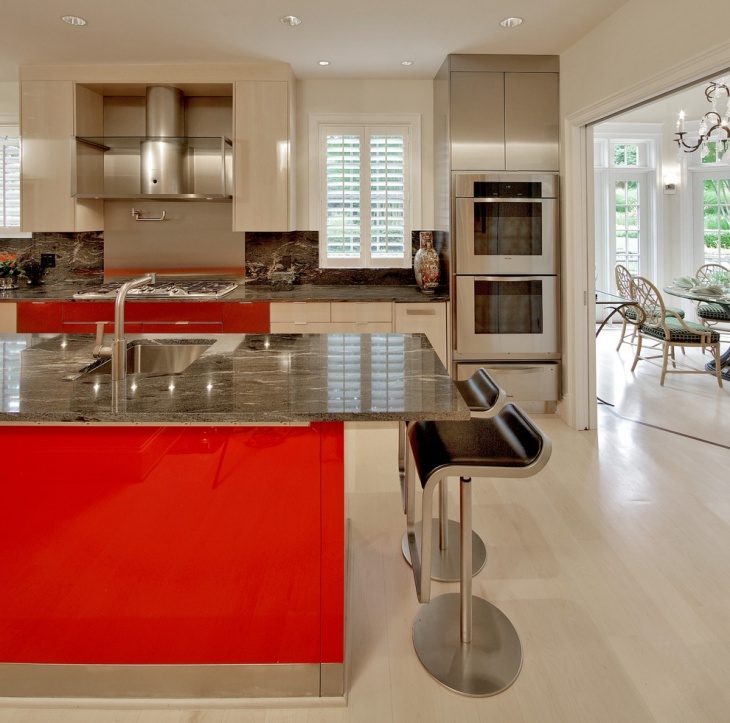 You can use red and white paints to color up the walls and ceiling of your kitchen. 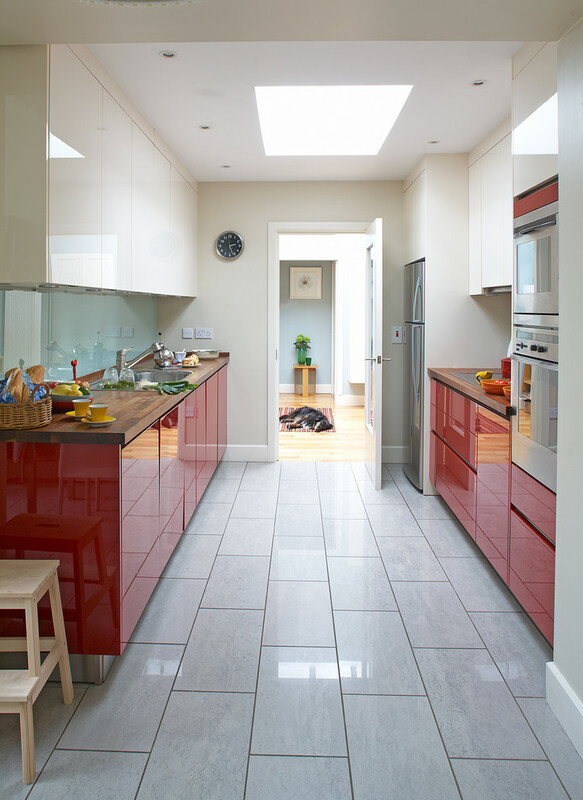 You can also use red tiles for the floor or the counter area. Using red furniture pieces is also a good idea. 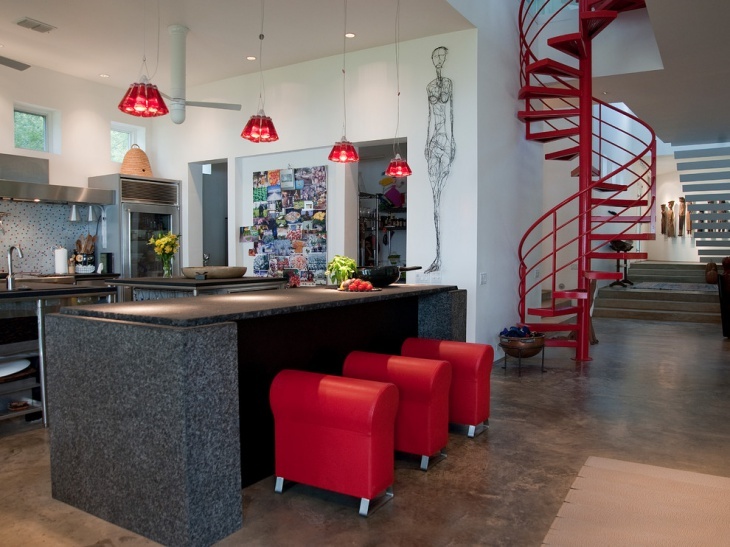 Other things that you can include in the design are; red and white kitchen rugs, red lights and red and white curtains. This kitchen is basically all-white except for the dark wood flooring and the furniture set. 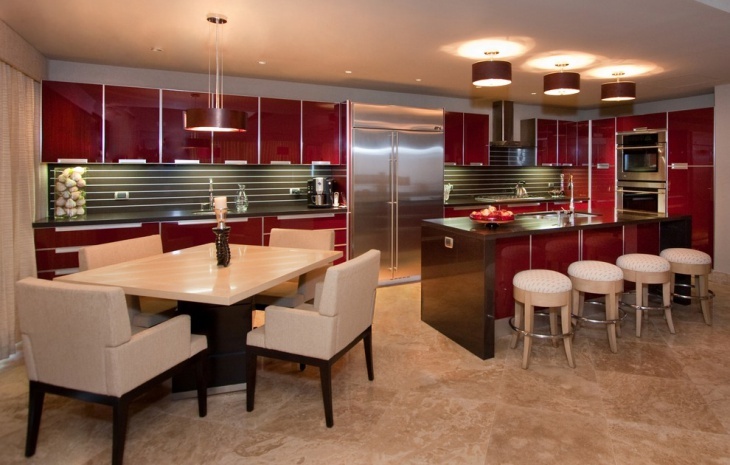 To create the red and white effect, the interior design is incorporated with chairs in red-brown upholstery. The red roses decoration added the red effect into the set up. The red and white curtains bring a nice stylish effect for this kitchen. 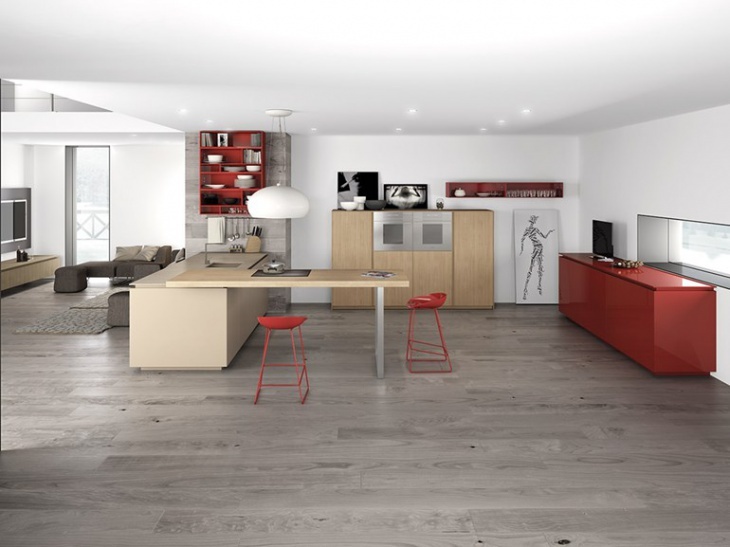 The whiteness of the walls and the rest of the room is given more emphasis by the red island cabinets. 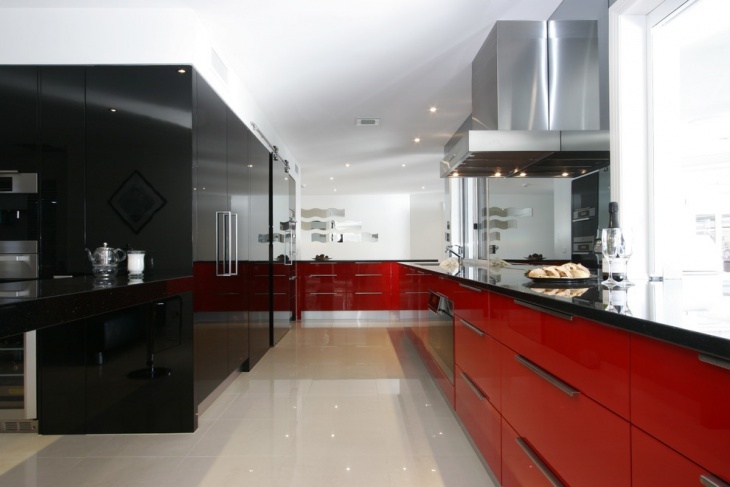 Black looks well with white and red, as shown in this kitchen. The black cabinets match the white wall and ceiling to perfection. To add the red look, kitchen appliances (range/stove and foor processor) and decor (framed flower image) are used. 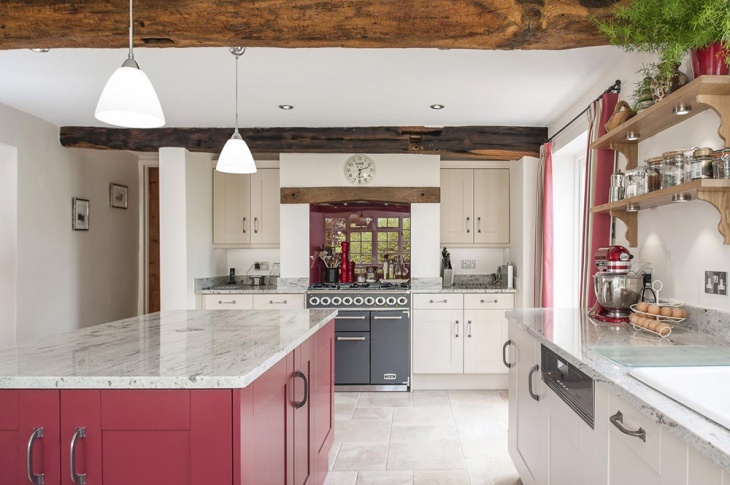 This kitchen looks so inviting with its white and red theme. 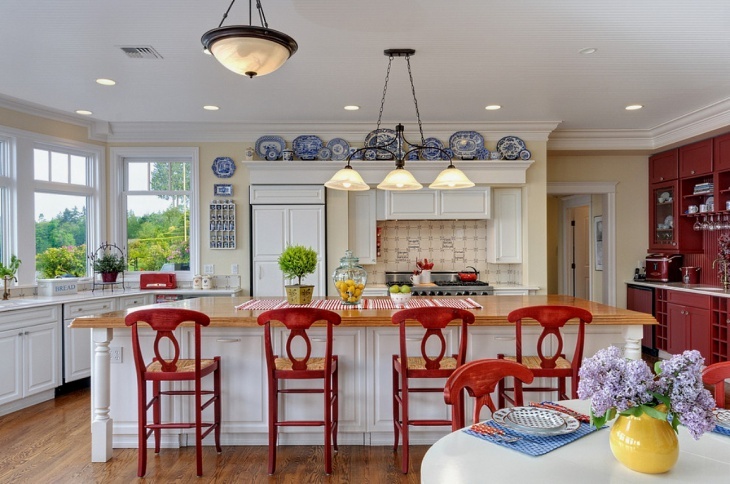 The red and white table mat adds a nice accent to the pale brown color of the island. 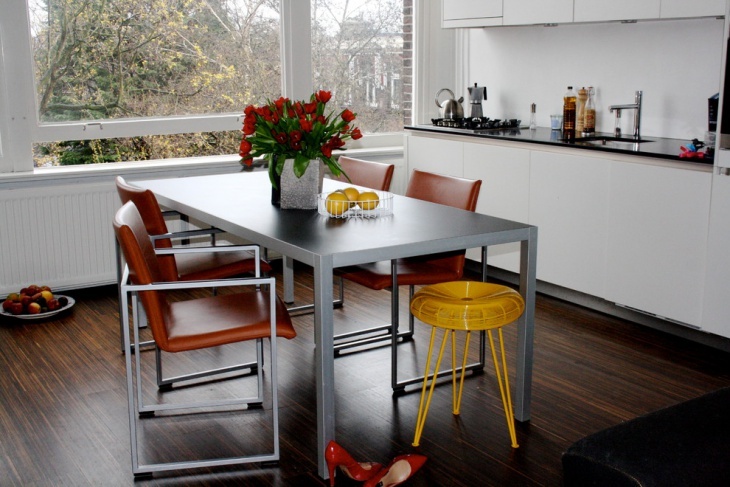 To match that red accent, a nice red cabinet and a beautiful set of red stools are incorporated into the whole scheme. 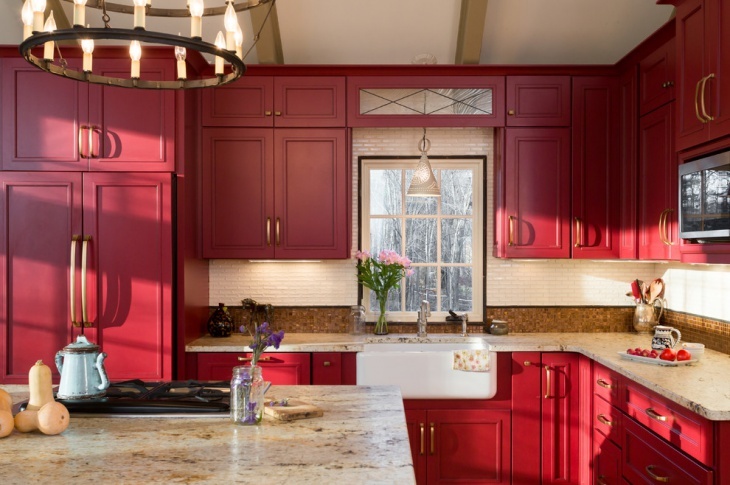 The red kitchen counter top for this room is ideally matched with the red bar stools and red pendant lights over the island. The red printed rug on the floor brings out the beauty of the polished dark brown wooden floor. 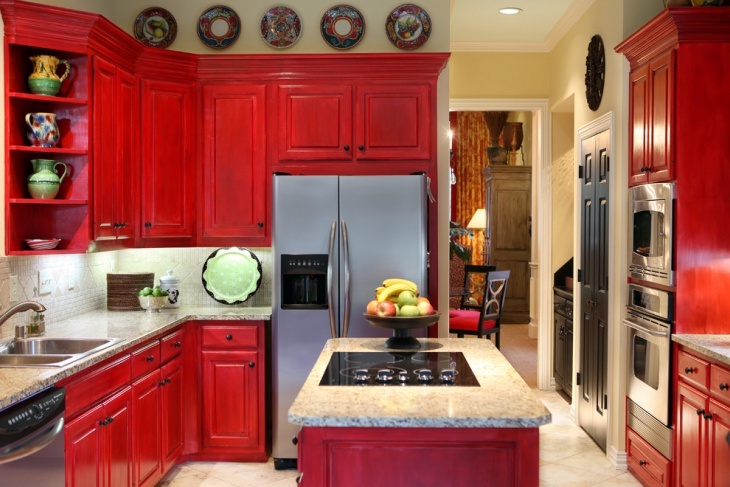 This kitchen has a nice island in light colored granite top and red cabinets. The red and white curtains provide a nice match to the island and together, they create a beautiful contrast to the white and rustic look of the kitchen. This white narrow kitchen may be limited in space, but it is definitely not limited in design appeal. 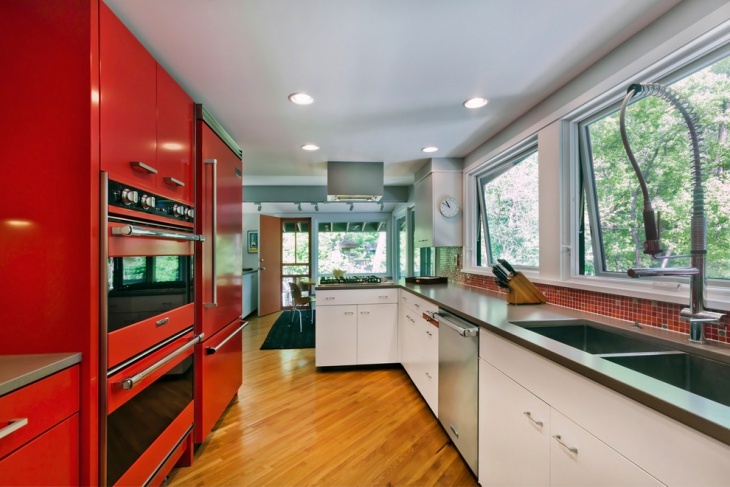 The red bottom cabinets are so polished that they actually the floor and everything else. The red backsplash tiles used for the wall of this kitchen provide a nice and bright accent into the all-white furnished and decorated room. 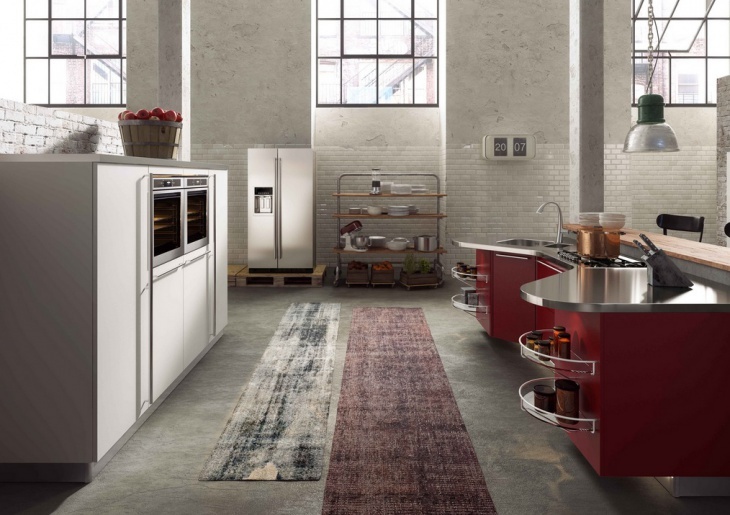 The result is really unique and amazing, proving that the red and white combination is really a good choice for a kitchen interior design. 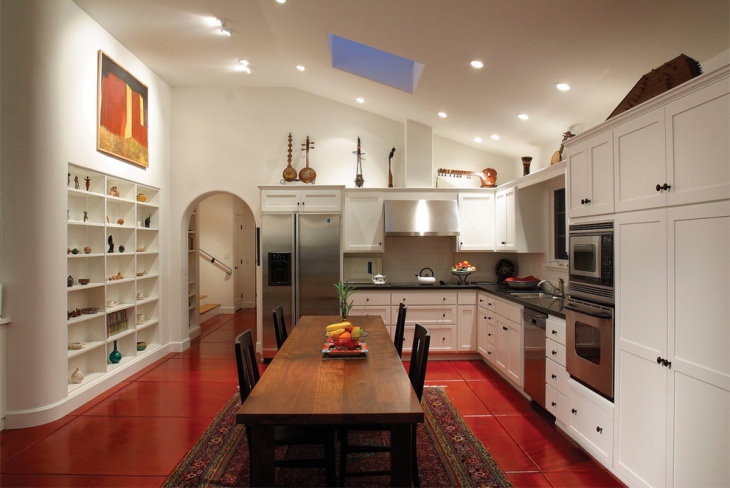 This white kitchen looks really nice and traditional. 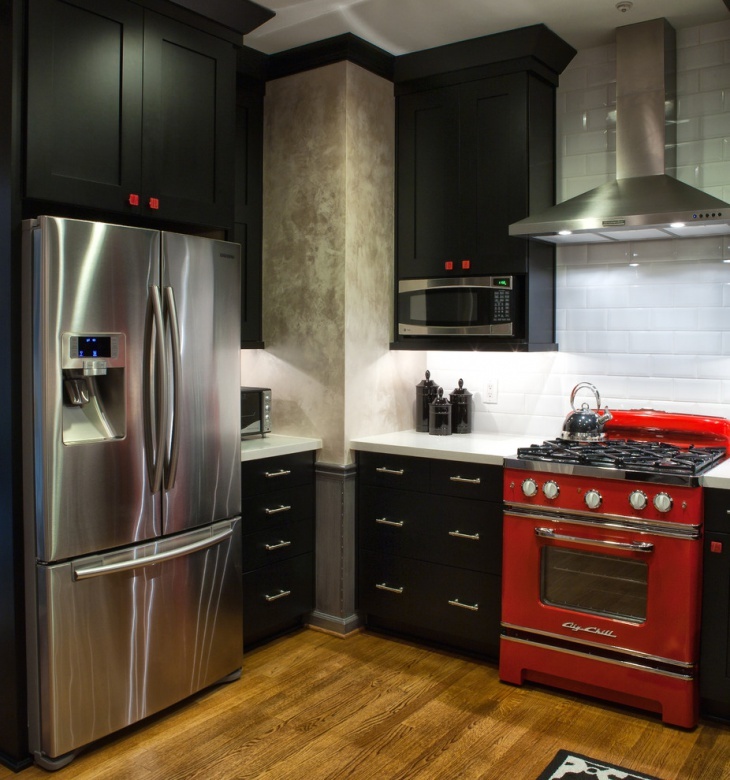 The dark brown countertop provides a nice break from the whiteness, while the red oven is the perfect accent in the whole set up. Red and white are colors that go well together. 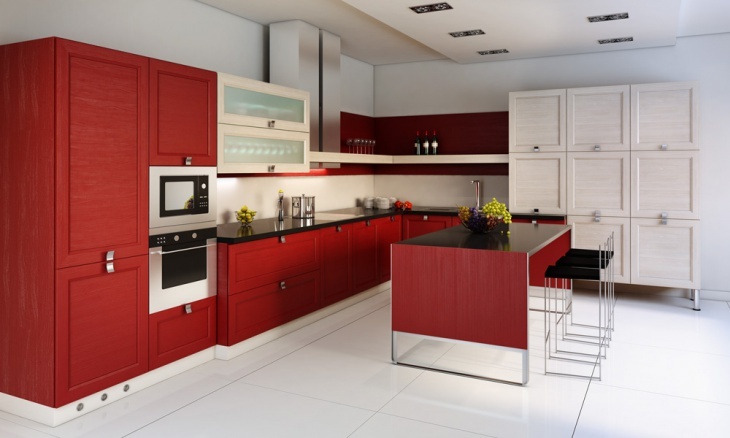 If you are going to use these colors for your kitchen interior design, choosing the right furniture, appliances and materials is very important. 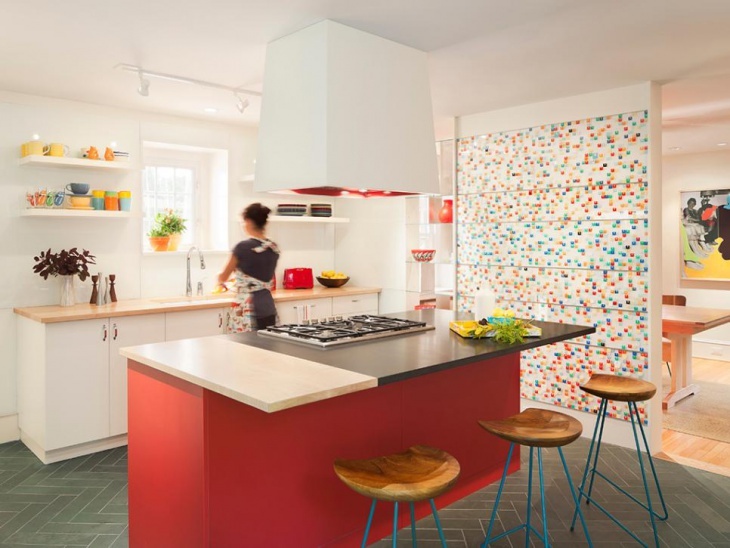 To create a more unique design, you can go for red white and blue kitchen decor.